Nigerian government is really doing it best to see that the young at heart, being the leaders of tomorrow, are trained up, to be highly equipped with creative skills. The aformentioned positive change which was said to overwhelme the country growth, is really working as it was said. 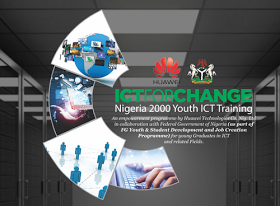 The government partnered with Huawei in order to develop a training course known as ICTforChange. The training is made possible for those between the age gap of 18 - 30 years, and also with a course field related to technology that has degree from either University or Polytechnic. The government made the training free for all Nigerian youths, that has the above expected requirements. ==>Huawei Certified Datacom Associate (HCDA) Certification, ==>BTS and Microwave Installation. After the training, who soever that is present in the training, will be issued certificate for it, and like I said earlier, the training is absolutely free of charge. And it is open for all youth in Nigeria. How To Register for The Huawei Training? To register, visit this link: http://www.ictforchange.gov.ng/about-ictforchange/ and fill your details as required. Wishing you Goodluck to that. Always help others by sharing important information to them. You can do exactly that by sharing this post with below share buttons or through the link of this post to your friends on Facebook, Twitter, Google+ etc. Thanks.